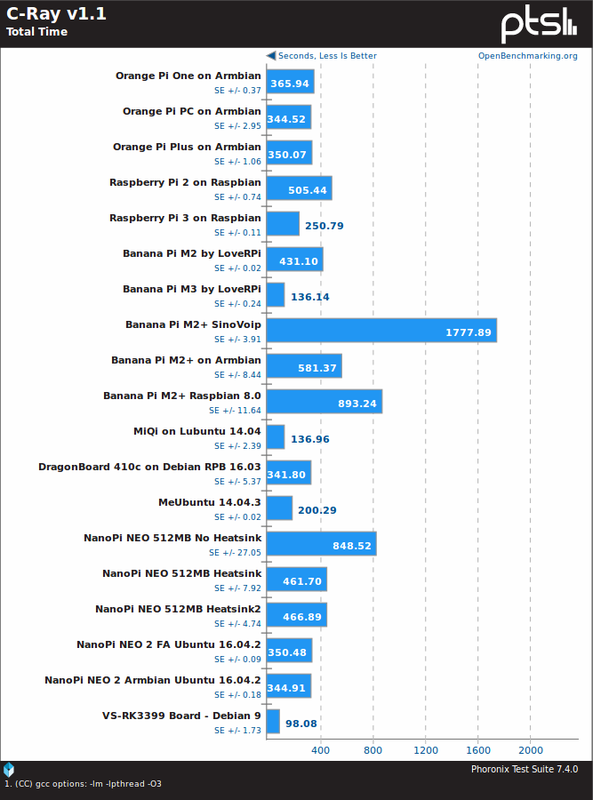 For whatever reasons OpenSSL and Mafft failed to download, but we still have the other benchmarks to compare with. Note that the Debian image is likely not optimized, and while the system runs an Aarch64 kernel, the rootfs is only 32-bit, which may have affected some of the benchmarks. But let’s see what’s we’ve got, starting with John the Ripper password cracker, a multi-threaded benchmark. 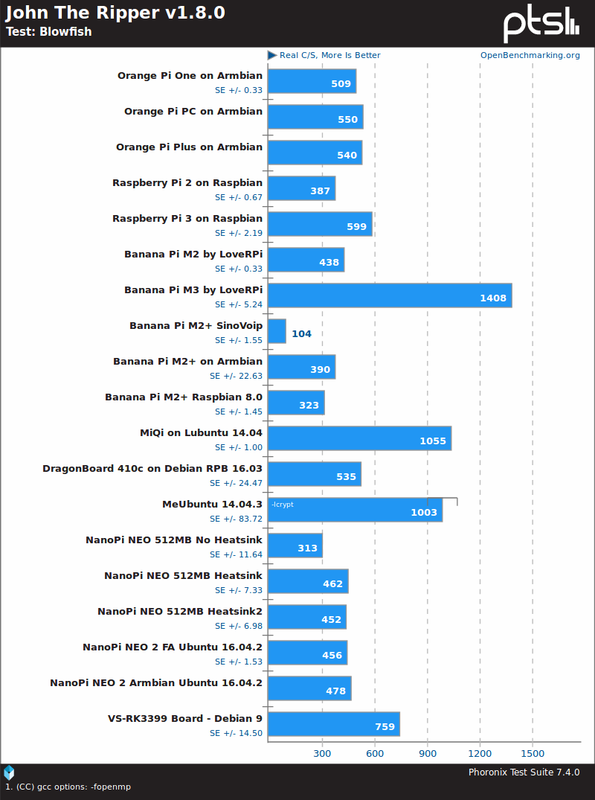 We’d normally expect hardware platforms based on Rockchip RK3399 SoC to outperform all other Cortex A53 or A17 based boards in the list, but MiQi board with a quad core Cortex A17 processor @ 1.8 GHz, and BPI-M3 board with an octa-core Cortex A7 processor @ 2.0 GHz, both beat the VS-RK3399 with an hexa-core processor with two Cortex A72 cores @ 1.8 GHz, and four Cortex A53 cores @ 1.4 GHz. 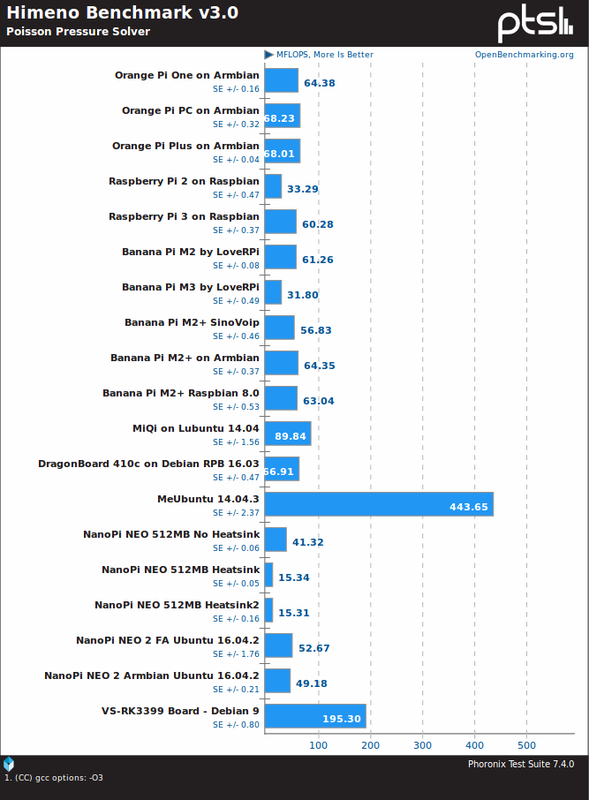 BPI-M3 is even twice as fast in this test. C-Ray is also a multi-threaded benchmark, but here Rockchip RK3399 SoC shines, making VS-RK3399 the fastest platform of the lot, also beating MeLE PCG02U TV stick (MeUbuntu 14.04.3) powered by an Intel Bay Trail Z3735F processor. Smallpt is another multi-threaded benchmark, and VS-RK3399 board does well, but it’s still beaten by the Intel TV stick (OpenMP might help here? 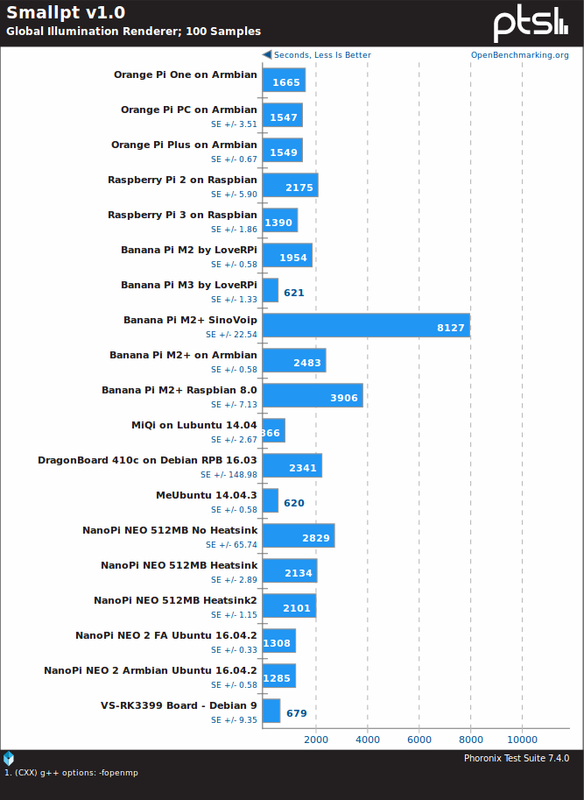 ), and Banana Pi M3. The Rockchip RK3399 board is the fastest ARM platform for Himeno linear solver of pressure Poisson, but due to specific x86 instructions and/or optimization, the Bay Trail TV stick is well ahead. 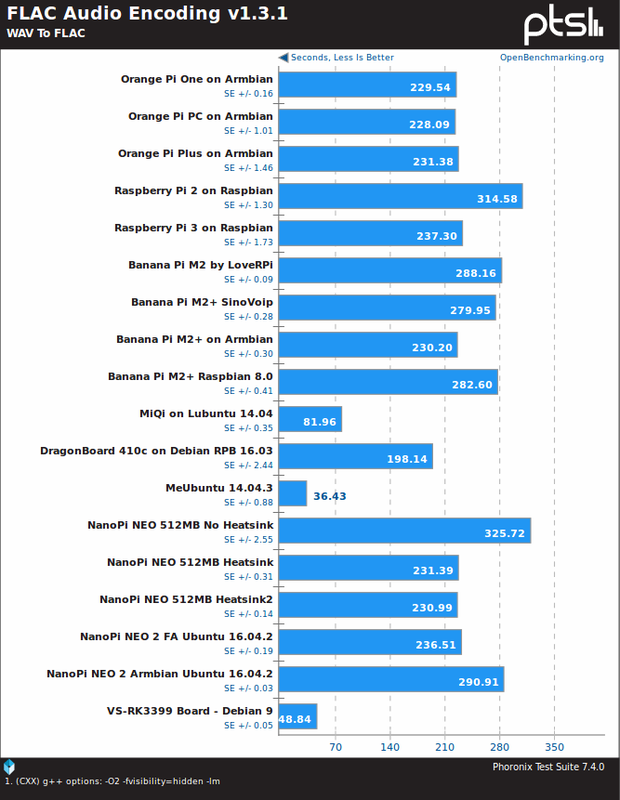 Finally, for FLAC audio encoding, VS-RK3399 is the best ARM platform (in the tested lot) by a wide margin, but Intel is ahead with their more advanced SIMD instructions. So Rockchip RK3399 processor will outperform all ARM boards with single threaded tasks thanks to it Cortex A72 cores, but in some multi-threaded tests, octa-core Cortex A7, and quad core Cortex A17 platforms may deliver better results. VS-RD-RK3399 board comes with a 32GB Samsung eMMC 5.0 flash that supposed to deliver 246/46 MB/s R/W speed, and 6K/5K R/W IOPS. Compiled for 32 bit mode. Time Resolution = 0.000001 seconds. Processor cache size set to 1024 kBytes. Processor cache line size set to 32 bytes. File stride size set to 17 * record size. Results for the read speed are around the theoretical limit, but write speeds are well above, maybe because of some caching. and it does improve a little compared to the first test without the tweaks. Check in YouTube if the id buydvb belongs to a . Check the FAQ of the plugin or send error messages to support. Check in YouTube if the id w2comp belongs to a . Check the FAQ of the plugin or send error messages to support.